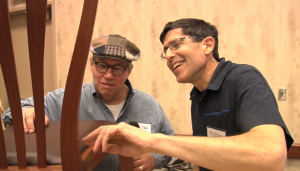 The Highland Woodworker Blog: Still Missing Woodworking in America? Well it has been almost two weeks since the midwest edition of WIA2012 and we are still missing the market place and all of those great and informative classes, and can’t wait until next year. During times like these when we wish we were back in Cincinnati and Northern Kentucky right now, it helps to be able to read a great description of the weekend on The Highland Woodworker blog. Take a look if you too are wishing that a Skyline Chili would open closer to your house.